Yes you just read the title of this message right. Our insider just gave us the first official “unconfirmed” specifications of the next generation Galaxy S, the Galaxy S IV. The Galaxy S IV will no longer use the Samsung EXYNOS processor and according to the latest rumours this processor has overheating issues. Today we can confirm Samsung will use the Snapdragon 600 and it is clocked at 1.9 Ghz which is 0.2 Ghz higher than the HTC One. The Galaxy S IV will have 2 GB of RAM and will come in three variants 16, 32 or 64 GB. As the rumours earlier reported Samsung is going to use a Full HD display. The Galaxy S IV uses a 4,99″ Full-HD SoLux Display we have no information if this is based on LCD3 like the HTC One. But a couple of months ago we posted the first hint regarding Samsung’s LCD factory is ready to produce Full HD panels from early 2013. And we also know Samsung’s AMOLED factory does have many problems with the production of full HD AMOLED screens. We also know more about the build and dimensions of the device. According to our insider the dimensions of the device are 140.1 x 71.8 x 7.7mm and the weight is 138 gram, the new Galaxy S IV will use a home button and will have touch buttons. If you look at the photo below you will see that it will be square formed again, so they dropped the Galaxy SIII design line. He also said the sides are made from aluminium but the back is still plastic which automatic hints to a removable battery which is good to know. Yesterday we already found out that the Galaxy S IV will have a 13 megapixel camera. 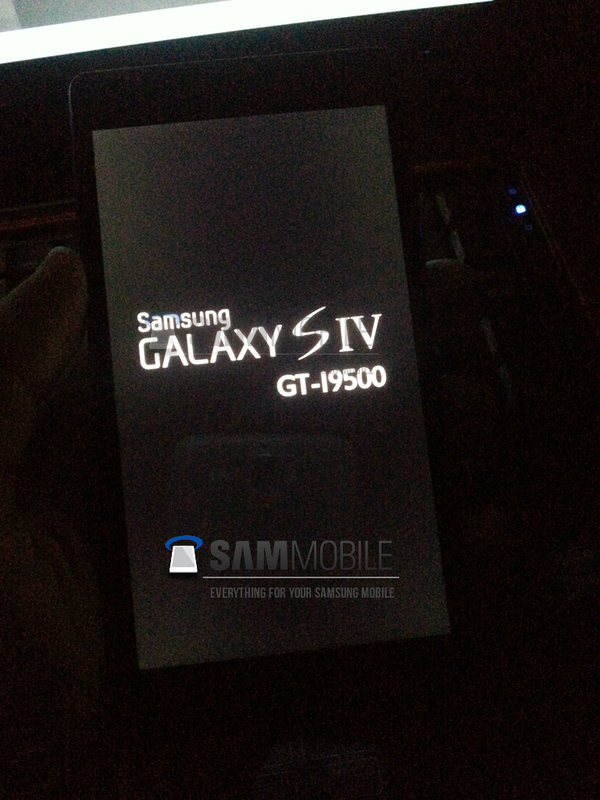 Some leaked photos created by the Galaxy S IV showed up to confirm that. If our insider is right again this is a bad sign for all the EXYNOS and AMOLED freaks out there. Below a list of the confirmed specifications through us right under the specification list you will see the boot screen photo. I was hoping for an end-to-end screen. No bevel. When are we going to get that? Please Samsung, more respect! It’s a flagship device!!! Learn from HTC, Aluminium, not plastic. Wow! so true. If the prozessor wont be an octa core and they wont use an unbreakable Amoled display, than the S4 is exactly the same like the Xperia Z and the HTC One. At least the One has some inovations e.g. the camera and the stereo speakers. Therefore everyone won´t buy the S4, because it isnt something special and ,as you said, the S3 will be just an “one hit wonder”. So please Sammy, don´t do the mainstream sh** like the other companys! It’s just a phone for, for God’s sake. Just helped me out with my decision; I will retire my SGS3 and picking up the HTC One !!! You seriously want to tangle with the hassle of HTC’s S-On/S-Off bootloaders? At the very least Samsung’s bootloaders are unlocked (minus Verizon) and you have Odin mode as a last ditch savior. The picture is fake. On all Samsung Galaxy S bootscreens the X in the word Galaxy touches the g in the word Samsung. This is the same on all resolutions 800×480, 1280×720 and 1280×800 so it will be the same on 1920×1080. I completely agree with you, emieltes. This is Sammie’s flagship smartphone, and they’ll do the right thing. Obviously, the picture is fake as the newly announced Note 8.0 sports the curved, rounded design. This shows they are not ditching the design. I call BS/fakey on both rumored last-minute changes. Complete nonsensical BS from some Apple zealot. First, wouldn’t you expect a different screenshot sample besides a white-on-black, obviously fake, banner? Gorgeous sample screen, ain’t it? If any of you watched the Sammie CES Keynote from January, they were pimping both AMOLED and Exynos in a big way. I *highly* doubt they would’ve done this so close to the product announcement were they contemplating even one of these outlandish claims. If it doesn’t make sense (which it doesn’t), then it’s a flat-out lie. I actually like this change. Dumping the Exynos with its big-little design for te qualcomm is a good idea. Also the dimensions of the phone are still in the acceptable range. Almost the same size as the S3. So lets say its true. Galaxy SIV is “ruined” (RUINED) because it will have a Full HD display with a pixel density of 468ppi (the highest pixel density on the planet). At the same time it will have the Snapdragon S600 (one of the fastest cpus ever). Yeah SIV is ruined noone will buy it. OH MY GOD WHY S600? NOW I WILL NOT BE ABLE TO PLAY CRYSIS 3 ON 1920×1080 AND THEN LAUNCH AND NUCLEAR ATTACK TO DESTROY MARS FROM MY PHONE. Ok it’s me again. Watched at the image again and it could be a Sony Xperia Z with s4 bootscreen…..can it? Another thing. Why is the “g” from samsung noy above the “x”from galaxy as it is with s2 and s3? Hey Danny is the battery size still looking like 2600mah? Also if this screen is the same as the DNA, I consider that great news. As for the CPU, I don’t really care either way. So no AMOLED, no S4. I LOVE my S3 for ever. Won’t upgrade to S4, if it isn’t an AMOLED. I do care about the replaceable battery. If it hadn’t one I might as well get a HTC. Goodbye to true black. Shame. Anyway, I’m sure that won’t be the final design of the S4. Guessing it is a prototype for development like that prototype SII they had on video. I hope this issue is resolved in the note 3. I really like amoleds. Sorry sammy but this is NOT FOR MEEEEE!!!!!!!! yes i mean GALAXY S..
Really Sammobile, why posting a picture of a s2 with a custom s4 bootscreen as if it’s the s4??? mmm you’re right about the black…..
snapdragon 600 is a really good cpu but there is also snapdragon 800. Apart from that there is also some other model of exynos that can do the job. Samsung always hide specs and general from future releases so it will not surprise me if all those have nothing to do with reality.Its the way sammy do such things,and always wait to release after all the others. We have to wait until official specs release..
Hmmm is the picture also taken with a white version of the galaxy S4?? Because when you look at the picture carefully, you can see the “reflections” of another device (Below the Galaxy S4 lettering). But for me, this is not the S3, or is it?